Yup, it is visually overwhelming. There is almost too much going on to make sense out of it. And this is actually a drastically reduced and filtered view of the funding relationships, most of the organizations have many additional ties that I am not displaying. 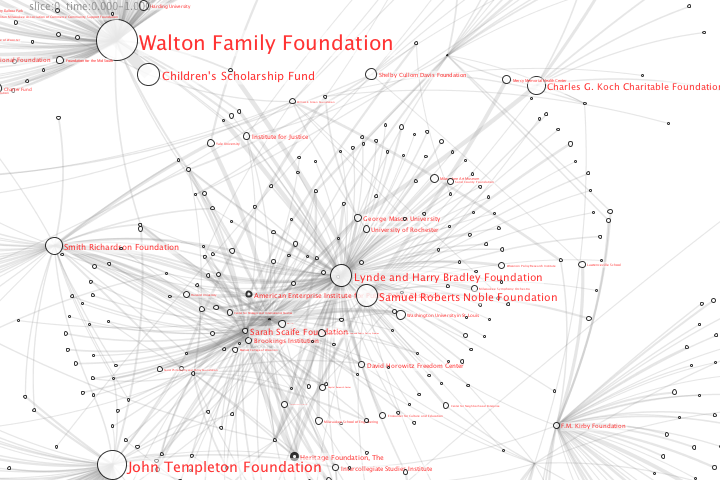 The Walton Family Foundation for example has ~2800 grants, of which I’m showing about 10. I’ve tried to use some size and color elements to help highlight large organizations and particularly strong relationships. I did this network map as a PDF, because it seems like a simple and portable way for viewers to zoom in and move around on the network. Also, I was able to embed URLs in the diagram, so if you click on a node it will load the appropriate Media Matters web page with a brief profile, additional financial information, etc. And you can use the “find” function in your pdf viewer to locate specific groups. Check out the two “Koch” foundations that have been in the news recently (also, here is a view of another type of Koch funding ties). Some foundations make contributions to themselves (Walton Family Foundation) or other closely related foundations (the two Kochs again). How many of these groups have you heard of before? Do the groupings and linkages make sense to you? Any thoughts or suggestions? I was kind of expecting to see different regions in the network covering specific issues. That is not immediately apparent to me here, but it could be because I don’t know the groups’ agendas well enough. Might be more interesting to look at a much larger set that also includes liberal groups and covers lots of issues, to see where the overlaps are. Would also be helpful to add some sort of issue or ideological coding to the groups. PublicEye.org has some interesting discussion of categorizations. According to Media Matters, the Conservative Transparency Project is an effort to track who is funding the conservative movement. Like its right-wing counterpart, activistcash.com (a project of the Center for Consumer Freedom, which is unfortunately missing from the dataset), the database of funding relationships, financial profiles, and key personnel is constructed using the public documents (Form 990) that non-profits are required to file with the IRS. I think this is fairly recent project of Media Matters, completing all of the profiles is a huge undertaking, and some of the more obscure organization still need to be aggregated. Pay/semi-free services like GuideStar and the Foundation Center probably have much more complete profiles, but also much grumpier use restrictions. Since the Conservative Transparency database has records for several thousand organizations, I needed to narrow the scope a bit to get a usable visualization. First, I only pulled down relationships that totaled more than $100,000. I then experimented with additional filtering out various organizations by the amount of money associated with them. I also tried hiding all the universities and colleges, and also only including organizations that received grants from at least two foundations. 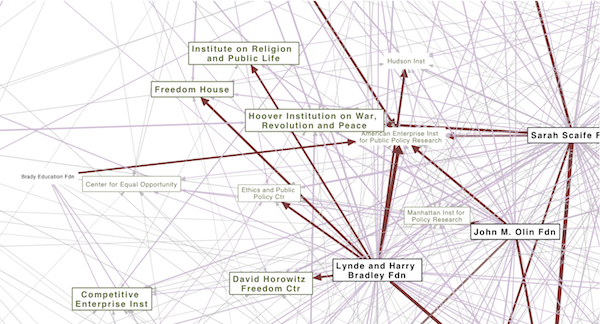 All of these views were interesting, but I wanted to focus in on a subset of “politically relevant” organizations for the visualization. Since I’m lazy (i.e. doing this for free) I’m not (yet) going to process the descriptions for keywords or try to categorize the groups by hand. So I finally settled on a kludge of only including organizations that Media Matters had a profile blurb for, assuming that they have started with the most interesting organizations. Set a larger bold fond and a thicker border on nodes with more than $1,000,000 in cash. Color all the edges with more than $500,000 in cash, and make them a little shorter. Then color all the edges with more than $5,000,000 in cash a darker color, give ’em a bigger arrow, and make ’em even shorter. Finally, feed the resulting network into the GraphViz neato command to calculate the layout positions, and produce a .eps postscript file. to do the pdf conversion. (Don’t use ps2pdf, it wont respect the image pagination). Only keep nodes in the network that have more than 1 tie. If a node’s label includes the string “University”, color it orange. Fantastic work! I’ve been fascinated by this kind of thing for years but haven’t found much until now! I Just found your site after reading an article in the Boston Globe on Philip Howard’s soft drink graph and am eager to absorb some of your other work. I’m now curious if 3-Dimensional interactive maps could help ease the data overload problem you mention.